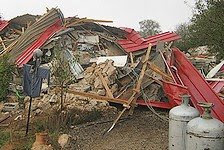 This is the Judean home of Noam Federman, destroyed on the orders of Ehud Olmert and Ehud Barak. Federman's crime: he loves his people and his homeland. But neither of the two Ehuds could bring themselves to lay a hand on the homes of the three Arab terrorists who slaughtered the students of Marcaz Harav yeshiva and bulldozed civilians to death in two Jerusalem street attacks.